Just love this shot! Awesome! This is insane. Love your website as well. Some seriously awesome shots there. Very nicely done. Gorgeous! Congratulations on your Peoples Choice win! Absolutely gorgeous and magical ! Absolutely amazing photo. I have tried doing this a couple times. Thanks for the inspiration. I will be trying more now. Congratulations on all your wins! Absolutely outstanding ... can't say anything else ... this just leaves me speechless! Inspirational! Absolutely stunning mate. Looks like I have to practice on my own skill! What amazing creativity, talent and skill demonstrated here???? REALLY a great picture !!! absolut in love with this image. great work! great work, amazing creativity, well done!! Panorama image of 32 images @ 15mm F2.8 ISO 6300 30s using a Canon 6d and Tamron 15-30mm. Imaging at Lake Dumbleyung Salt Lake in Western Australia. The water is only a few inches deep, so can walk onto the lake. 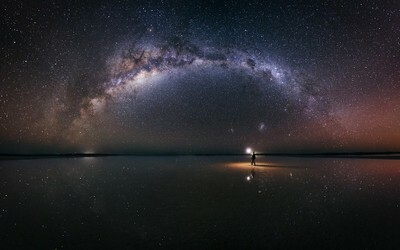 Wanting to emphasise scale of the milky way in this image with the star reflections. So stood a bit further back and used my flash with a CTO gel.